The Southeastern Conference was created in 1933, when 14 schools – including the 10 institutions that would become the historical core of the league – broke away from the huge, cumbersome Southern Conference. Everywhere you turned at the time, it seemed a former Notre Dame player under Coach Knute Rockne was leading the way. At Alabama, former Irish quarterback Frank Thomas (1920-21-22) was in his third year of a Hall of Fame career in guiding the Crimson Tide. His 1933 team would win the first SEC championship with an overall 7-1-1 record, the only loss coming in the biggest game of the year, a non-conference battle in New York City against Fordham, coached by Notre Dame Four Horseman Jim Crowley. In an epic battle watched by a season-high 60,000 at the Polo Grounds, Crowley’s Rams blocked a punt into the end zone for a safety and won, 2-0. Alabama’s ends, by the way, were a pair of Hall of Famers named Don Hutson and Bear Bryant. Thomas would go on to lead the Tide to Rose Bowl victories after the 1932 and 1945 seasons, along with a Cotton Bowl titles to cap 1941, followed by the Orange Bowl crown after 1942. Irish fullback Chet Wynne (1918-19-20-21) was head coach for seven years at Creighton before taking the Auburn job in 1930. He compiled a 22-15-2 mark through 1933 on the Plains. Wynne left in 1934 to take over at Kentucky, and was replaced by Jack Meagher (ND end, 1916), coming from Rice. Under Meagher, the Tigers went 48-37-10 the next nine seasons, capturing the Orange Bowl after the 1937 season. At Florida, close Rockne friend Charlie Bachman (G, 1914-15-16) had just left after guiding the Gators to a 27-18-3 mark from 1928-32. Bachman took the Michigan State job, and coached the Spartans through 1946, compiling a 70-34-10 mark. Later, former Rockne player and assistant coach Tom Lieb would guide the Gators during the war years after a nine-year run at Loyola of California. And at Georgia, former Irish center Harry Mehre (1919-20-21) was in the midst of a successful decade as the Bulldogs head coach, after serving as an assistant for the previous four years. Mehre led Georgia to a record of 59-34-6 from 1928-37. 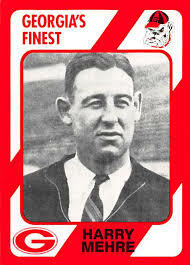 He left in 1938 to take the top job at Ole Miss, where his Rebels went 39-26-1 from 1938-45. Several of the schools that remained in the Southern Conference after the breakup of 1933 were also led by Rockne protégés. Chuck Collins, the left end for the Seven Mules on the national championship team of 1924, guided North Carolina from 1926-33, compiling a 38-31-9 mark and finishing third in the conference in 1929 and 1933. Buck Shaw (T, 1919-20-21) spent one season as head coach at North Carolina State in 1924, the start of a Hall of Fame coaching career that would include stops as head coach at Nevada, Santa Clara, Cal and Air Force. Shaw ended his nearly four decade career by capturing an NFL championship in 1960 coaching the Philadelphia Eagles, who handed Vince Lombardi his only playoff loss with the Green Bay Packers. The Wolfpack were later coached by former ND greats Clipper Smith (1931-33) and Hunk Anderson (1934-36). Rex Enrights (Notre Dame FB, 1923-25) guided the South Carolina Gamecocks for 15 seasons (1938-42, 1946-55) and an overall mark of 64-69-7. And Gene Oberst (T, 1920-22-23) led Southern member Washington & Lee in 1929 and 1930. All these men and their careers as football coaches were testament to Rockne’s incredible reach nationwide. His office at Notre Dame could rightly be described as a de facto athletic employment agency, as schools – high schools, prep schools, colleges and universities from across the country – continually sought his aid in identifying bright young men to become their coaches and athletic directors. Rockne was, truly, Coach For A Nation.